In the last few years there have been many advancements in baby monitors. 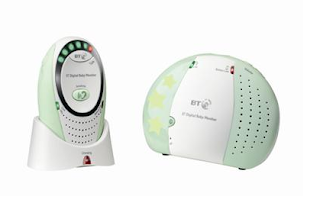 Some new models allow you to watch your baby while they sleep, others track the temperature in your nursery and now the BT Baby Monitor combines an intercom feature, which means that a constant link is maintained between parent and baby. Talkback allows you to soothe your baby from the Parent unit, or to talk back to someone at the Baby unit. Star lights give a soft comforting nightlight. Sound Sensitive Lights let you turn the Parent unit volume down and still know when your baby stirs. Portable parent unit allows you to take it up to 300m outdoors and 50m indoors (in ideal conditions)- giving you the freedom to move around with the confidence that you can still hear your baby. Adjustable belt clip means you can keep the Parent unit wherever you go.